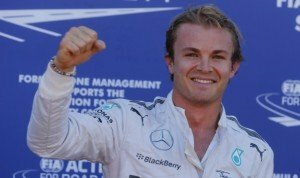 Nico Rosberg takes pole after an exciting qualifying session in Montreal. His 1:14.874 was just enough to beat Hamilton, who starts second with a difference of +0.079. The gap to the rest of the field was some 7 tenths with Vettel (1:15.548) being best of the rest, a stunning lap puts him in 3rd. The gap from 3rd to 6th was just 4 hundredths of a second. Bottas (1:15.550) was just 0.002 seconds slower than Vettel followed by teammate Massa (1:15.578) and Ricciardo (1:15.589). Alonso, Vergne, Button and Raikkonen complete the top 10. In the first part of qualifying Ericsson caused a red flag with 16 seconds to go. He spun his car in turn 9, hitting the barrier and damaging the left rear of the car. He later explained the incident was his fault and he was just pushing too hard to get a better laptime. Gutierrez didn’t set a time in Q1 and will therefore start from the back of the grid. The damage on the car from his crash in the last practice session was too much for the team to repair in time for qualifying. Maldonado also had a problem in Q1 with his car and had to park in the runoff area at turn 3, which prevented him from improving his laptime, meaning he was out in Q1. Chilton, Bianchi and Ericsson also didn’t make it to Q2. In the second part of qualifying Hulkenberg just failed to make it through with only 0.045 seconds separating him and P10. Magnussen was out qualified by Button who finished in P9 and Perez spun out while on a fast lap. Grosjean, Kvyat and Sutil were also out in Q2. For the full results see below. Just a guy with a passion for motorsports.